AGUIRRE-RAMOS, F. , MORALES-REYES, A. , CUMPLIDO, R. , FEREGRINO-URIBE, C.
This article presents a composed architecture for the CORDIC algorithm. CORDIC is a widely used technique to calculate basic trigonometric functions using only additions and shifts. This composed architecture combines an initial coarse stage to approximate sine and cosine functions, and a second stage to finely tune those values while CORDIC operates on rotation mode. Both stages contribute to shorten the algorithmic steps required to fully execute the CORDIC algorithm. For comparison purposes, the Xilinx CORDIC logiCORE IP and previously reported research are used. The proposed architecture aims at reducing hardware resources usage as its key objective. J. E. Volder, "The CORDIC Trigonometric Computing Technique," IEEE Transactions on Electronic Computers, vol. EC-8, no. 3, pp. 330-334, Sep. 1959. J.S. Walther, "A unified algorithm for elementary functions", in Proc. AFIPS Conf., vol. 38, 1971, pp. 385-389. C.-C. Sun, P. Donner, and J. Götze, "VLSI implementation of a configurable IP Core for quantized discrete cosine and integer transforms," International Journal of Circuit Theory and Applications, vol. 40, no. 11, pp. 1107-1126, Nov. 2012. J.-H. Lee, T.-H. Cheng, and H.-C. Chen, "Design of IIR linear-phase nonuniform-division filter banks with signed powers-of-two coefficients," International Journal of Circuit Theory and Applications, vol. 37, no. 7, pp. 811-834, Sep. 2009. M. Abo-Zahhad and M. F. Fahmy, "Synthesis of low-sensitivity orthogonal digital filters," International Journal of Circuit Theory and Applications, vol. 25, no. 6, pp. 503-520, Nov. 1997. Maharatna, K., Banerjee, S., Grass, E., Krstic, M., & Troya, A. (2005). Modified virtually scaling-free adaptive CORDIC rotator algorithm and architecture. IEEE Transcations on Circuits and Systems Video Technology, 11(11), 1463-1474. B. Lakshmi and a. S. Dhar, "VLSI architecture for low latency radix-4 CORDIC," Computers & Electrical Engineering, vol. 37, no. 6, pp. 1032-1042, Nov. 2011. T. K. Rodrigues and E. E. Swartzlander Jr., "Adaptive CORDIC: Using Parallel Angle Recoding to Accelerate Rotations," IEEE Transactions on Computers, vol. 59, no. 4, pp. 522-531, Apr. 2010. J.-A. Lee and T. Lang, "Constant-factor redundant CORDIC for angle calculation and rotation," Computers, IEEE Transactions on, vol. 41, no. 8, pp. 1016-1025, 1992. K. Maharatna, S. Banerjee, E. Grass, M. Krstic, and A. Troya, "Modified virtually scaling-free adaptive CORDIC rotator algorithm and architecture," IEEE Transactions on Circuits and Systems for Video Technology, vol. 15, no. 11, pp. 1463-1474, Nov. 2005. T. Juang, "Low Latency Angle Recoding Methods for the Higher Bit-Width Parallel CORDIC Rotator Implementations," IEEE Transactions on Circuits and Systems II: Express Briefs, vol. 55, no. 11, pp. 1139-1143, Nov. 2008. T.-B. Juang, S.-F. Hsiao, and M.-Y. Tsai, "Para-CORDIC: Parallel CORDIC Rotation Algorithm," IEEE Transactions on Circuits and Systems I: Regular Papers, vol. 51, no. 8, pp. 1515-1524, Aug. 2004. 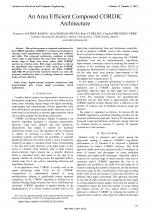 S. Aggarwal and K. Khare, "Leading One Detection Hyperbolic CORDIC with Enhanced Range of Convergence," Journal of Signal Processing Systems, Feb. 2012. D.-M. Ross, S. Miller, M. Sima, and M. McGuire, "Exploration of sign precomputation-based CORDIC in reconfigurable systems," in 2011 Conference Record of the Forty Fifth Asilomar Conference on Signals, Systems and Computers (ASILOMAR), 2011, pp. 2186-2191. M. Kuhlmann and K. K. Parhi, "P-CORDIC? : A Precomputation Based Rotation," EURASIP Journal on Applied Signal Processing, vol. 2002, no. 1, pp. 936-943, 2002. B. Gisuthan, "Flat CORDIC: a unified architecture for high-speed generation of trigonometric and hyperbolic functions," in Proceedings of the 43rd IEEE Midwest Symposium on Circuits and Systems, 2000, 2000, pp. 1414-1417. M. S. Sinith and K. Jismi, "A comparison of pipelined parallel and iterative CORDIC design on FPGA," in 2010 5th International Conference on Industrial and Information Systems, 2010, no. i, pp. 239-243. Xilinx Inc., "LogiCORE IP CORDIC v4.0. Product Specification, DS249," 2011. J. Xu, T. Arslan, D. Wan, and Q. Wang, "GPS attitude determination using a genetic algorithm," in Evolutionary Computation, Proceedings of the 2002 Congress on, 2002, vol. 1, pp. 998-1002. E. F. Stefatos and T. Arslan, "High-performance adaptive GPS attitude determination VLSI architecture," in Signal Processing Systems, 2004. SIPS 2004. IEEE Workshop on, 2004, pp. 233-238. Citations for references updated on 2019-04-22 15:52 in 134 seconds. Website conception, design and maintenance by Eugen COCA. Content updated on 28 Feb 2019. Site engine updated on 28 Feb 2019. This page was generated on the server in 0.099 seconds and loaded in your browser in > seconds.